My Card Attic: And now for something different . . ! Different? Well, this is a 'hybrid' card (a card made using a mixture of digital and traditional card methods in the same card. I used a Kraft card base, a strip of patterned paper and a greeting - all printed on my printer. Next, I stamped the flowers & leaves and die cut them using my Stampin' Up 'Flower Fair' bundle. 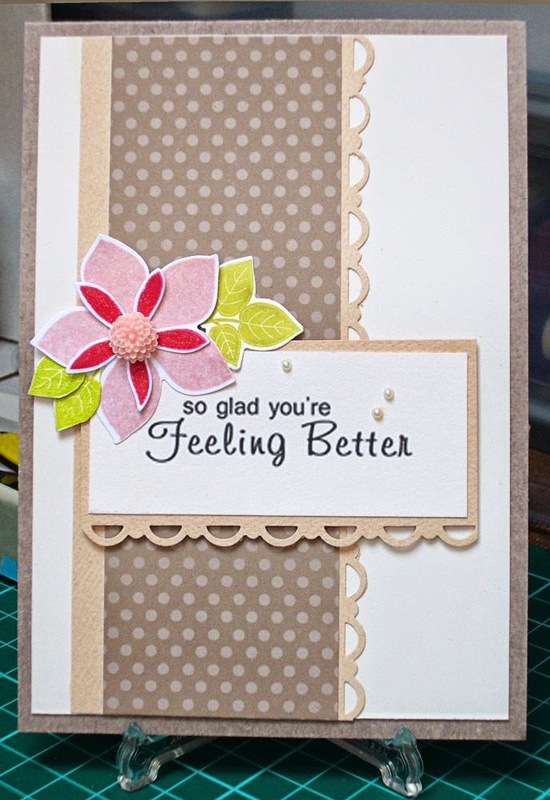 Then, I used some strips of coloured cardstock and punched a border using my Stampin' Up border punch and mounted it all on a plain white background and mounted it to the base card. To finish, I added some tiny pearls, a touch of Wink Of Stella glitter pen in clear & a resin flower. Do any of you like the hybrid cards, or are you true traditionalists?